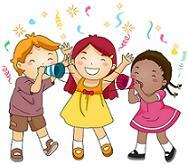 Using daycare marketing tips will ensure that your home based daycare stays full to capacity. According to Merriam Webster, advertising is defined as, “the action of calling something to the attention of the public". Child Care Resource and Referral. This is an excellent resource and accounted for nearly half my clients over a period of fourteen years. This is a service that matches parents looking for providers with available daycare homes in their area. This is a great form of daycare advertising that works year round. Here, in Minnesota, I didn’t need to do anything other than get my license to be added to the list. Once you have your license, feel free to contact them to make sure you have been added. Word-of-Mouth Advertising.Tell everyone you know about your new venture. Daycare advertising is easy when you notify neighbors, co-workers, family and friends. Do not limit yourself to only those that have children. Everyone has the potential to know someone in need of child care. The people who know you best will be able to refer people looking for child care directly to you. There is no better form of daycare marketing than to have satisfied parents tell others about you. 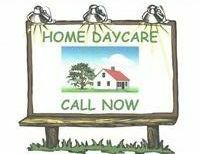 Run your child care home like a professional, keeping both children and parents happy, and over time there may be no need to publicize. Parents who referred other parents accounted for half of the children in my care. When you are first starting out however, your daycare marketing campaign will have to be creative. The most obvious? Make flyers with tear-off tabs. Make the flyers colorful and child friendly. Use bright colors (red, blue, yellow) and suitable clip-art (teddy bears, balloons, toys), or pictures of smiling happy children. Advertising child care in this way should attract the attention of parents and children. On the tear-off tab place both your phone number and the term daycare or child care. Use on bulletin boards. *Helpful hint: Never place your exact address on any advertising. Simply place the general area your home is located in. Examples: close to Harder Park or near the Town Hall. Also, do not specify any particular age group. If you receive calls for a child you cannot accept at the time, start a waiting list. You never know when a child may be leaving your care. I also do not recommend listing a price on the flyers. You want parents to choose your home based on how they feel about you and your home, not based on price. Only discuss fees during an interview. Daycare marketing also takes place during the interview. Where are the best places to place your flyers? Anywhere that people tend to gather. Try grocery and hardware stores, laundromats, community centers, beauty salons, coffee shops, college campuses, apartment complexes, toy stores and indoor playgrounds. Daycare marketing can happen almost anywhere. *Hint: Before placing any ads on public boards, get permission. Sometimes there are size limitations. Realize too that public boards normally have a time limit, sometimes as little as a week. You’ll have to regularly check and replace flyers as necessary. 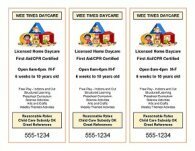 These are a low-cost form of daycare marketing and can be passed out to just about everyone. There are many on-line sites that will let you design the cards from a multitude of choice options. Leave several with local real estate agents. 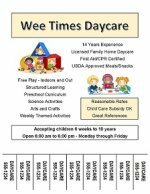 Families new to the area may well need child care. Same thing if your area still offers Welcome Wagon for new residents. Check to see if your cards can be placed in the packages. Make copies of your business cards or print off colorful slips of paper with your daycare name and phone number. Attach to the treats you pass out. This is potentially an effective way to advertise your daycare because the recipients of such cards generally live close by. A brand new daycare is news. Some smaller local stations have on-air community bulletin boards. Call your local station directly and inquire regarding the necessary steps to get your message heard. Realize that due to time constraints your message will most likely have to be short. There are many places on the web where you can create a free web site. List your qualifications and the best features of your own unique daycare. As your business expands, add pictures of your playroom and outdoor area. Make sure that all advertising materials list your web address as well. *Once again, do not list your actual address. Give a general area only. Stay away from listing fees too. You want parents to make the step to an interview and see personally what your daycare has to offer. This type of daycare marketing either works well or it doesn’t. Even long time providers are split on how effective it is. Smaller local papers are probably better for this type of advertising than big city larger ones. A better way to make the newspaper work for you? Once you are semi-established, have an event and send your local paper a picture and a brief description. A daycare provider I know did this when Santa came to visit her daycare and again when a few members of the high school theater group stopped by to put on a puppet show. Her daycare got tons of exposure and she received several calls. Think outside the box when advertising child care. For book donations, the books must be new but need not be expensive. Place a donated by sticker with your daycare name, town or city location, and phone number on the book. Donate the books to anywhere children may have to wait. Try doctor offices, dentists or barber shops. Buy over-sized T-Shirts in a bright color, and have your business name and phone number printed on them. When you take the children out and about, slip the T-Shirts on over their regular clothes. This will provide exposure for your daycare and the added benefit of easily keeping track of the children. Buy pens personalized with your business name and phone number. Normally you can buy quite a few at an affordable price. Pass them out or accidentally leave them places. Every summer our town puts on a parade. Several businesses make floats for this event, and most of the town turns out to watch. One enterprising local child care provider decorated a trailer and placed large signs promoting her daycare on each side. I honestly don’t know if she received extra calls due to this effort, though I’m certain the image of happy children tossing candy was seen by everyone. This form of daycare marketing will let people in your area know exactly where you are. Not only will parents living close to you be aware of your daycare, but odds are, they will mention your daycare to other parents. Check first for zoning restrictions. Just a bright sign with your business name and phone number is enough. As you can see, there are many different ways for you to promote your new business. Continue to advertise in some way even when you are full. Many daycare providers have waiting lists. And remember... that the very best form of daycare marketing is to offer a quality service.